Code-Movies #1 is an e-poetry project developed by Brazilian researcher and multimedia artist Giselle Beiguelman. The project integrates a series titled / / ** Code-UP, developed from 2004. / / ** Code-UP is an project based on algorithmic manipulation of images captured with mobile phones. The source of the images of / / ** Code-UP are the frames of Blow-Up (1966), the first film in English from the Italian director, Michelangelo Antonioni. The choice of Blow-up by Bielguelman was no accident. The Antonioni´s film script is inspired by the story “Blow-up” (1959) written by Argentine writer Julio Cortázar. In the tale, a photographer becomes obsessed with the probable circumstances surrounding a photograph that he makes of an unknown woman and a young boy in a Parisian park. Cortazar´s tale reveals the literary narrative through a photographic image viewer that offers its multiple layers of meaning of the object or scene depicted. In / / ** Code-UP, frames from Antonioni’s film Blow-up are displayed in an interactive installation for viewers to use their mobile phones to photograph and send images via Bluetooth to some computers installed in the same environment. Once in the computers, the frames of the Blow-up may be manipulated via the keyboard and mouse by the viewer that explores the spatial dimension of the image that gains movement and multidimensionality. The program converts the numerical manipulation of RGB color frame numbers and measures of height values​​. In digital format, the Blow-up frame is a set of information programmed in code form. Thus, in the digital image, each image aspect as we know it: the shape, the colors, the tones, brightness, contrast, etc.. are transformed into computer code based on mathematical and operational functions with alphabetic signs. Code-movie 1 was composed with computer languages like ​​hexadecimal, ASCII and binary codes extracted from images in JPG format. The process is to open the selected Blow-up’s digital image with a text editor so that it only has access to lines of programming. 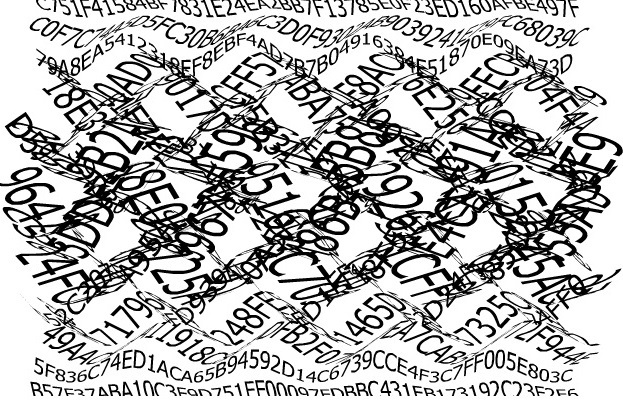 So the code extracted from the image was animated in Flash in various directions and distortions of shape and size. At the end of the animation process, a soundtrack composed by Brazilian multimedia artist Helga Stein is included. Code Movie #1 is based on Alan Sondheim‘s codework concept for whom the computer programming code are strictly defined for actions that occur inside the machine. Therefore, the code is not dominated by most accustomed to the shallowness of the GUI users. For Sondheim, the computer and the Internet have opened up new possibilities for literature not only through multimedia and hypertext writing, but also through dynamic or static textual forms that act as the metaphorical bones, molecules, and atoms of computer programming. Through the aesthetics of codework, Giselle Beiguelman’s Code Movies shows a new way of translation, in which a film is viewed through your computer code. This operation allows the usual form of the aesthetic object let it show its constructive process. The strangeness settles at the moment that are not cinematic images, but codes in motion. The viewer of an Code Movie realizes that all information in the digital environment is a set of codes subject to a new aesthetic intervention.